After more than 40 years of educating, 24 years at Liberty High School, and 10 at Liberty North High School, Dr. Martin Jacobs has finally decided to retire. Students, staff, alumni, friends, and family flocked to the Liberty North High School Fieldhouse on Friday, February 22, participating in a night to honor the beloved principal. “Dr. Jacobs will always be special to us and he is irreplaceable. He does so much for others, so he more than deserved one night centered on him, where people had a chance to show how grateful they are for what he’s done,” Sports Marketing Teacher Melynda McCabe said. Fittingly enough, cross-town rivals Liberty High School and Liberty North High School played, the games selected so both schools Dr. Jacobs worked at could celebrate his leadership. Dr. Jacobs was honored with the game ball from North and a jersey with the number 24 on it from Liberty, representing his time at the school. “Dr. Jacobs taught at Liberty and Liberty North, so we just thought it’d be a good night for all the teachers to come in and for people to get shirts and support Dr. Jacobs… The [sports marketing] teacher sparked the idea and we just developed the idea of it. This [planning] has gone on for maybe two months. The whole class has pitched in,” Sports Marketing student Andrew Hennessey said. For one night, the two schools were able to put their differences aside and show Dr. Jacobs how much he meant to them. T-shirts adorned with Eagle and Blue Jay ties were sold, along with Dr. Jacob’s bobblehead for those who preordered shirts. The money from the shirts went to a cause Dr. Jacobs is passionate about. “What I really like about it is they did the T-shirts and the bobblehead and said they were going to use the money for a foundation. I’m going to start a foundation when I retire that will be a fund for a very substantial scholarship to high school teachers who want to get a masters degree in reading, because I believe that we need to have teachers who have reading expertise at the high school level, just as we do at the elementary and junior high level. Because we still have kids who come to the high school that haven’t quite gotten to a real successful level yet and we know we can [get them there] but we don’t have the expertise yet. So, that part was very joyful and wonderful for me,” former Liberty principal and current Liberty North principal Dr. Martin Jacobs said. The night was a way for Dr. Jacob’s peers to celebrate his role in their lives. One of his past staff members at Liberty reflected on her favorite memory of Dr. Jacobs and his support for people he knows. “In 1998 I received a reward for working with teacher educators in Osage Beach, Missouri, at 7:00 at night. And lo and behold he showed up for it. He drove down there after school, he stayed for the presentation and the program, then he turned around and went back. I’ve never felt so special in my life. And he did that for other people too, it wasn’t just me. He showed up at graduation parties, at weddings, at funerals, at concerts he didn’t have to go to. He was very supportive of all the people he worked for and students,” Former math teacher Phyllis Chatlos said. Due to Dr. Jacob’s support at a number of events and his presence at the two schools, his impact has been felt for dozens of graduation classes, as at the end of this school year, he will have graduated about 10,500 students. He attends concerts, games, and other events he doesn’t have to be at. “One of my classmates passed away my freshman year of college. Even though we had graduated, Dr. Jacobs attended his funeral and helped support us and his family as we went through my classmate’s difficult passing. I will always remember how he spoke to everyone, and he stuck around to talk to anyone who needed to be counseled and was a strong, positive presence during such a traumatic time,” Former student and current ELA teacher Roselynn Zicarelli said. 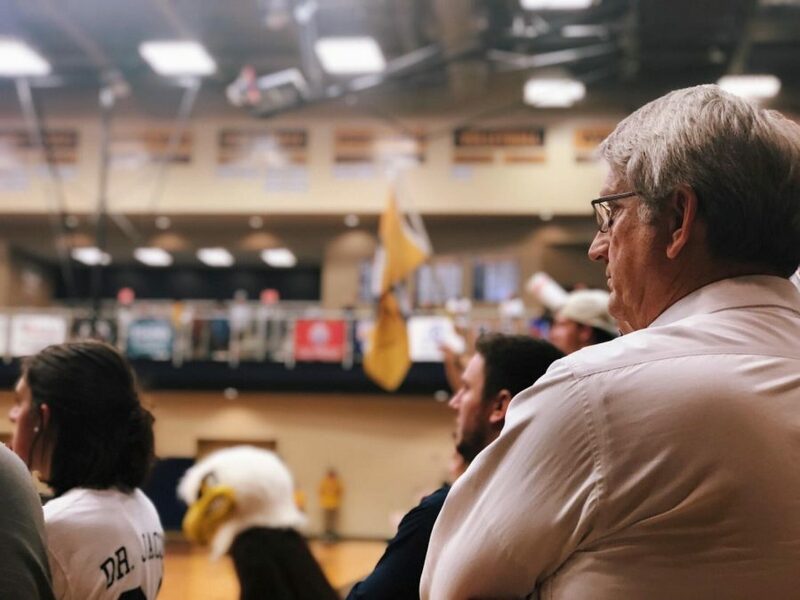 Students and staff alike have made it clear how much Dr. Jacobs has meant to them, from tweets, to their attendance at Dr. J Night, to the spreading of the hashtag #onceajayalwaysaneagle, or even just a simple acknowledgment in conversation. “I think that people who haven’t been a student or a staff member in a school that Dr. Jacobs has led don’t quite understand how influential and important his tenure has been. I hope people take away that when someone that talented and that compassionate is in a leadership position, the excellence trickles down through the staff and through the student body. LHS and LNHS became better schools and better environments because of Dr. J, and those improvements have continued and will continue into the future as long as people strive to embody the ideals that Dr. J did so well.” Former student and current chemistry teacher Spencer Fish said. As for Dr. Jacobs, who leaves Liberty Public Schools with a legacy of humility, compassion, supportiveness, and sacrifice. Thousands have been touched by his legacy, and thousands more will feel the ripple of his impact. What he wants to leave behind is simply this: a reminder of the importance of love. “I’ve thought about that some as I share things with staff and probably will particularly with the senior class. It’s really important that we care and love for each other regardless of our background, regardless of our faith, regardless of any differences people might perceive in us because we’re all human beings and we need to treat each other in a really good way. So that’s the biggest thing, I hope, that will continue. We’re not there yet, but it’s something to work for, treating each other right and well and that’s what I hope for,” Jacobs said.